Power Metals Corp. is pleased to announce that it has discovered large spodumene megacrysts (up to 32 cm long) on the Northeast Dyke located 900 m northeast along strike of the current drill program on the North and Main Dykes and is within the same tonalite dome as the North and Main Dykes. This discovery of these large and abundant coarse grained spodumene crystals gives us evidence of the presence of high grade lithium. Since the Northeast, North and the Main Dykes are along the same strike and within the same dome indicates that they were emplaced along the same deep-seated structure. The Northeast Dyke has a pair of parallel pegmatite dykes: north and south outcrops similar to the North and Main Dykes that are currently being drilled. 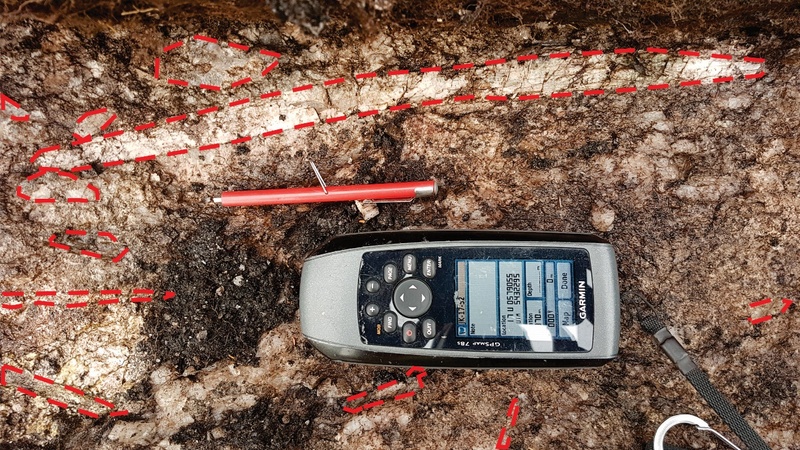 Power Metals' exploration team peeled back thick moss to discover abundant coarse-grained spodumene crystals on the south outcrop of the Northeast Dyke whereas the one previous historic grab sample had no spodumene (Figure 4). The spodumene crystals ranges from 3 to 13 cm long and up to 2 to 3 cm wide. The spodumene ranges from 2-10% and locally up to 20% of the pegmatite dyke. One green spodumene crystal was 32 cm long by 2 cm wide (Figure 1). The mineralogy of the south outcrop is similar to that in the Main Dyke. The pegmatite consists of white coarse-grained K-feldspar, quartz, spodumene and muscovite. 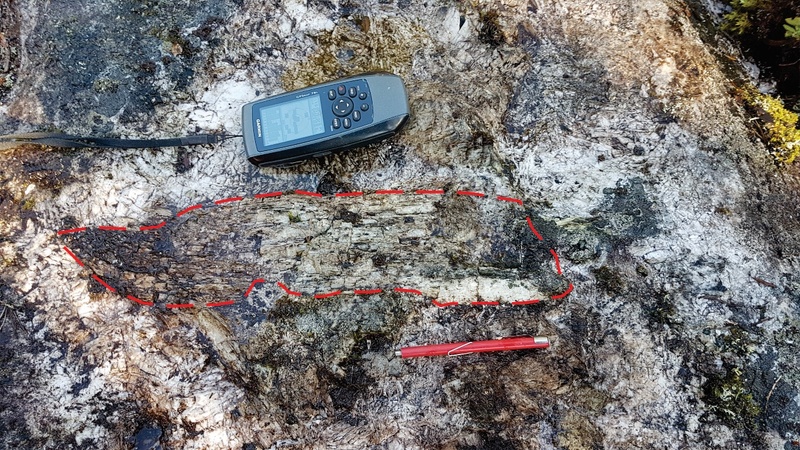 The quartz core of the pegmatite dyke contains up to 40% spodumene megacrysts with cross sections up to 14 cm across (Figure 2). The length of the spodumene crystals is always greater than the cross section, so these are significantly long crystals. 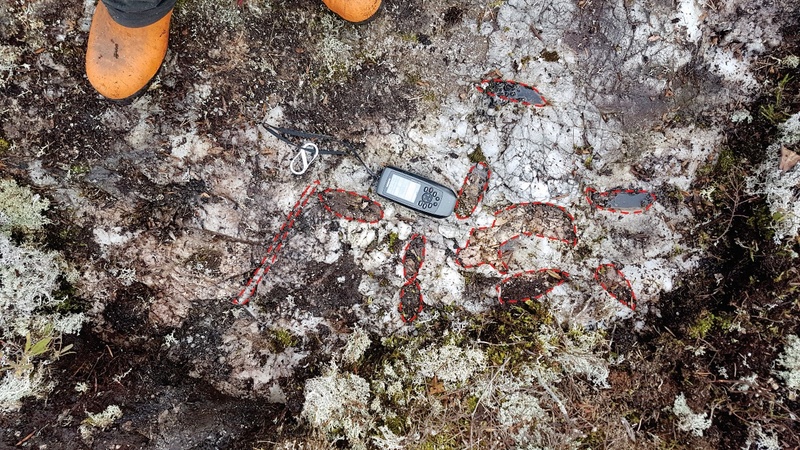 Brent Butler, P.Geo and CEO of Power Metals stated, "These newly discovered spodumene crystals in this new zone are the largest I have ever seen on any property in all my years." 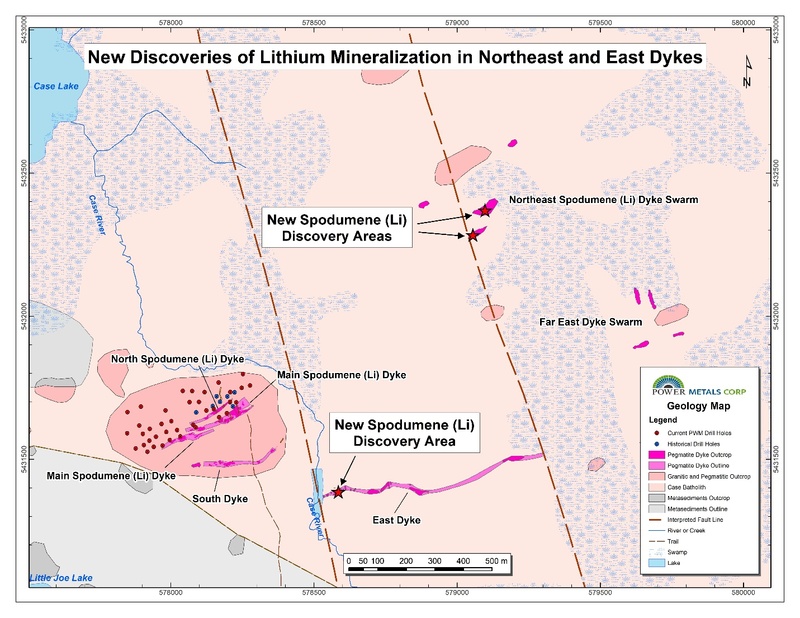 Dr. Selway, VP of Exploration stated "The discovery of spodumene megacrysts in the two outcrops for the Northeast Dyke indicates that this dyke has high potential to host spodumene mineralization similar to that in the Main Dyke. I am excited to drill the Northeast Dyke this winter to test the extent of the lithium mineralization." Brent Butler, CEO stated, "Case Lake continues to amaze us. 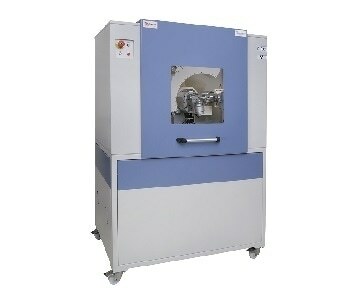 Firstly, we are nearing completion of our initial 5000 m drill program and we will have a large amount of assays to press release to the market in the coming 2 months as we receive assay results from the lab. 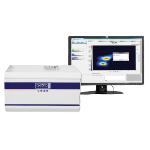 The first batch of assays we press released on November 2nd were exceptional so we are excited to see more. Secondly, this new high grade zone located approximately 1km away from our current drill site is a huge discovery as the richness of spodumene in this new zone looks to be richer than what was on surface at our current drill location."